Donations from citizens keep the BTP viable and any donation over $20 is furnished with a tax receipt. 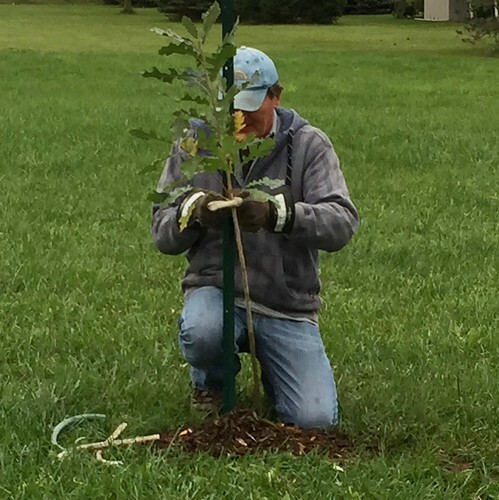 Cheques may be made payable to: ABCA Foundation / Bayfield Trees and mailed to Bayfield Tree Project, P.O. 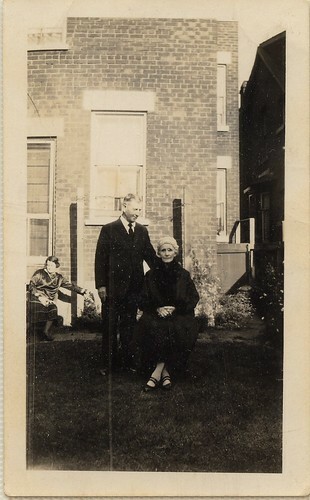 Box 164, Bayfield, ON, NOM 1G0. Rachel Handbury will be addressing those in attendance at this event. Her topic is “Waste- Not at the Zoo”. She is the Manager of Sustainability for the Detroit Zoological Society. She is responsible for initiating, implementing and continually improving the sustainability program at the Zoo. 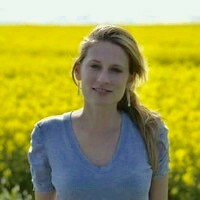 She takes a special interest in food waste diversion, plastic waste reduction, sustainability education and energy reduction initiatives. Handbury worked previously in Los Angeles, CA, as an environmental consultant, managing the remedial cleanup efforts of hydrocarbon-contaminated soil and groundwater. A Canadian, she is a graduate of Western in Biology and Environmental Science. This is her second visit to a Blue Bayfield event. The monthly Councilor’s Corner held in the Bayfield Community Centre is set for tomorrow (Oct. 18). Bill Whetstone, Bayfield Ward councilor, hosts the evening on the third Thursday of every month. He provides an opportunity for people to hear what council has been up to and voice their opinions. The evening will begin at 7 p.m. 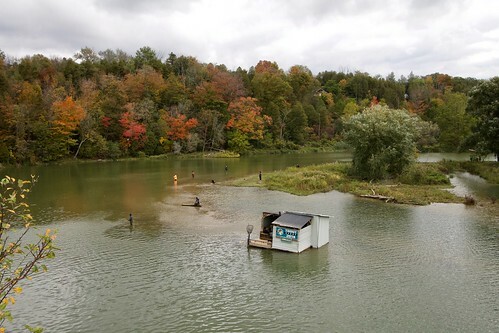 The main topics of discussion this month will be a recap on the vision for Bayfield’s next four years, Bluewater’s voting process and help centre info, and the Feasibility Study for the Bayfield Arena. The Bayfield Farmers' Market (BFM) wrapped up their most successful season ever on Thanksgiving weekend. Sincere thanks are offered to regular customers and visitors alike, whose patronage of the weekly market ensures the presence of top-quality vendors. Several of the BFM vendors will participate in Goderich's Makers' Market, opening Nov.17, at Square Brew, 430 Parsons Court, Goderich. The BFM will return to Clan Gregor Square on Victoria Day weekend 2019. A call for vendors will go out early in the new year. Roger Lewington will be the guest speaker at the next meeting of the Bayfield Historical Society to be held on Monday, Oct. 22 at the Bayfield Lions’ Community Building. 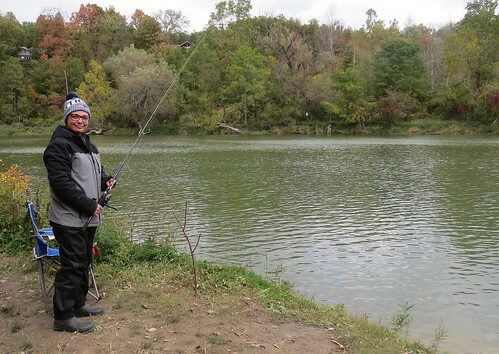 This next instalment of the Speakers Series will begin at 7:30 p.m. and Lewington’s topic will be, “The Huron Tract Land Trust Conservancy”. 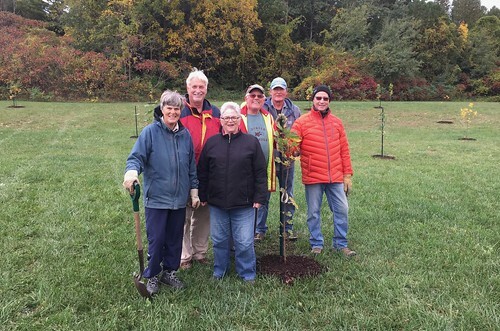 The Conservancy gives people a new and local way to make a positive difference by helping protect and restore land, water and nature in the historic Huron Tract area within Huron, Lambton, Middlesex and Perth counties. This can be done by leaving financial contributions and/or bequests of real property for the protection of the land, water and species in perpetuity. Lewington will bring a guest who has contributed as well another member of the Conservancy board to further enhance attendees understanding of the Trust. The Friends of the Bayfield Library (FOBL) would like to invite all in the community to join them in a lively discussion on a variety of social topics over a cup of a hot brew. “Coffee & Conversation” will be held at the Bayfield Public Library every Wednesday until March from 2-3:30 p.m. This is a great opportunity for people to meet their neighbors, learn about the village and share their know how with others. Bayfield Guiding members are now selling those yummy Chocolatey Mint Girl Guide Cookies for $5 a box. Profits from sales help with program activities, field trips and camps. The Bayfield Committee for Huron Residential Hospice is hosting a Murder Mystery Dinner Theatre at the Bayfield Town Hall on Friday, Nov. 2 and Saturday Nov. 3. Please note that both performances are now sold out! 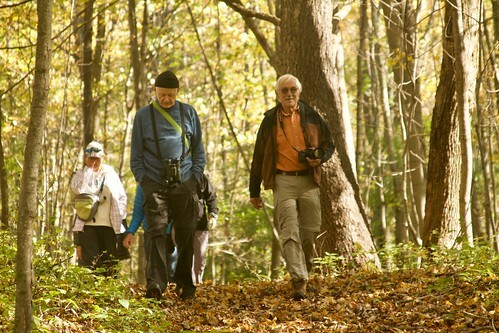 The Bayfield River Valley Trail Association (BRVTA) hosted a Photography Hike at the Hullett Sugar Bush in the Hullett Provincial Wildlife Area on Sunday, Oct. 14. 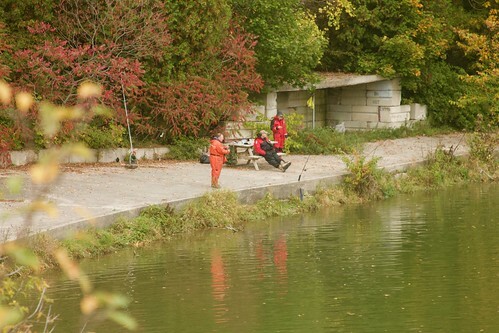 About 20 people of all ages took the leisurely hike along 4-5 KMs of trail over a two-hour period enjoying numerous stops for nature photography. 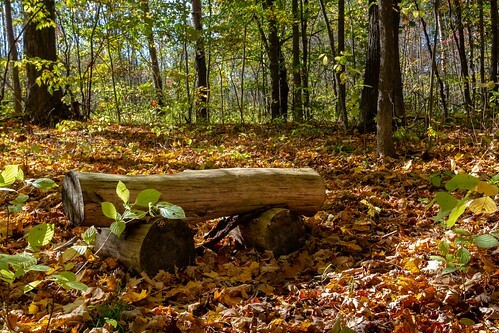 Jack Pal and Conrad Kuiper from the Photography Club of Bayfield offered tips on how to capture the beauty of autumn on the trails. 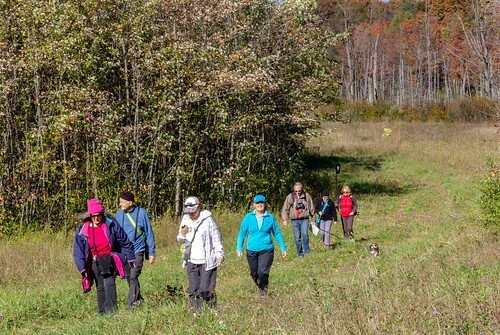 The hike took participants along portions of the Blue, Green, Yellow and Purple trails through the Sugar Bush including areas of woodland, meadow and fallow field. The weather cooperated making it a picture-perfect day for hikers! Pun intended. 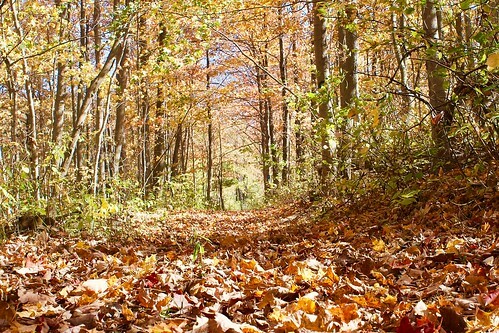 The Blue Trail, which is the main trail in the Sugar Bush, is one of the most common trails at Hullett and meanders through both woodland and meadow and links to numerous other trails. 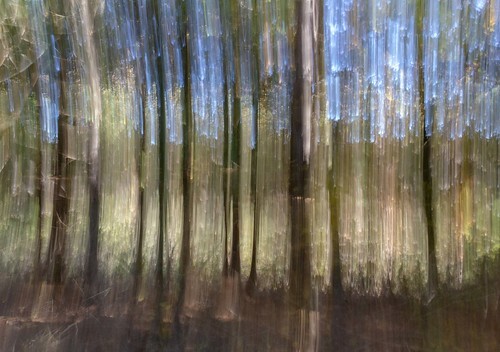 A simple landscape becomes intriguing with a simple move of the camera while the shutter is open. Hullett marsh is in continual change. 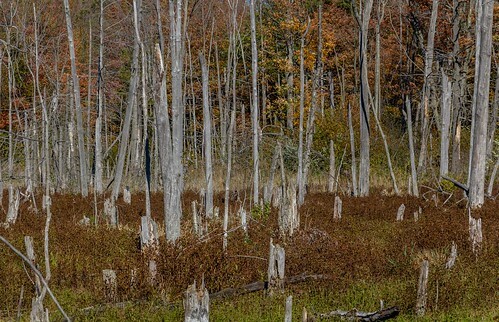 Here a whole copse of trees have died due to the changing water levels. 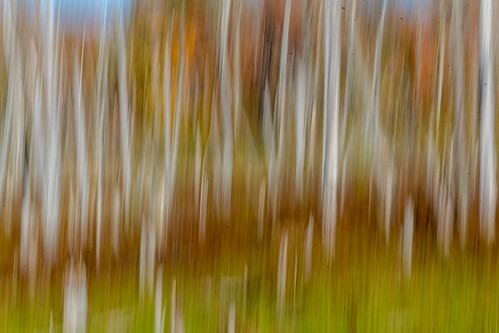 Purposeful camera motion, in this case a slight upward flick at slow shutter speed, changed the previous photo to this painterly composition. Other photo tips that were shared included shallow depth of field to capture flowers up close, various perspectives, low and high, to see things from a different angle and compositional guides such as "rule of thirds" to make a more pleasing image. 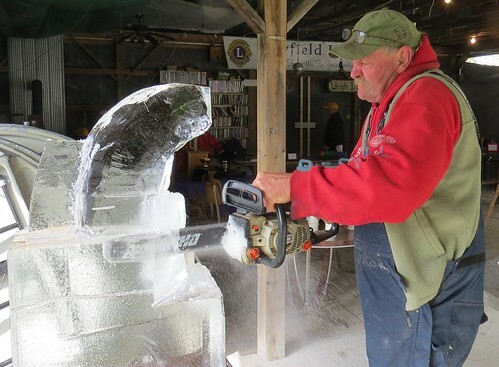 The temperature rose to about 17C in the Hullett Sugar Bush on Sunday afternoon. One of the biggest events of the year in Grand Bend is this Saturday, Oct. 20 at the Huron Country Playhouse. The Rotary Club of Grand Bend’s Autumn Indulgence is an annual favorite which partners food, drink and entertainment in the spirit of community fundraising for one spectacular evening. This year’s “Black Forest” theme features a gourmet dinner by Hessenland Country Inn and the house band from Kitchener’s famed Concordia Club, The Black Forest Band. It gets underway at 5 p.m. with all refreshments included for a truly memorable evening featuring many varied and unique silent auction items. Attendees can bid online at the event on their Smartphone or tablet. There are over 70 fabulous silent auction packages from a Florida condo, sunset yacht cruises, golf and hockey packages to food and entertainment items. The exciting live auction features trips to St. Lucia and St. Maarten with flights, a whole home Standby Generator, and a collection of six bottles of rare scotch. 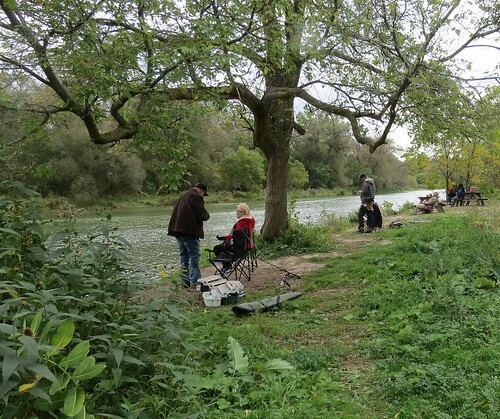 All proceeds are used to fund the many projects Rotary undertakes in the area from Bayfield to Port Franks and Hensall to Parkhill as well as their international projects. 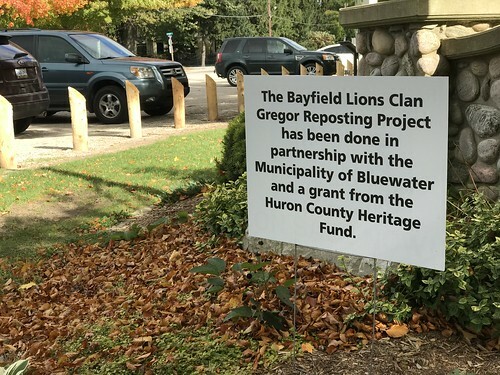 Following Bayfield’s lead the club has adopted a focus on reducing single use plastics and will direct some of the funds raised to further environmental projects. Come out and see how Grand Bend parties and share in the fun. Tickets are $150 for an all-inclusive evening of food, drinks and prizes. They are available at www.autumnindulgence.com. 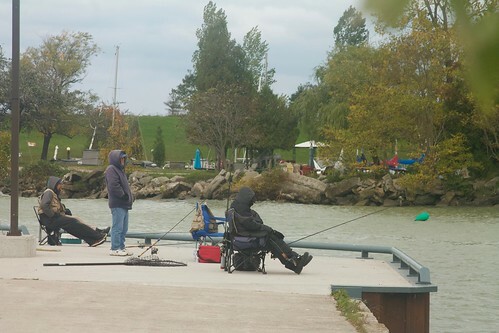 The project is part of the HPSPRC’s current research project, “How Much is Enough?” The project is researching the lived experiences of people in Perth-Huron who make less than a living wage and the impact this has on day-to-day living for individuals and the broader community. The research will provide recommendations to local and provincial governments, agencies, employers and community groups for addressing the impact of not having a living wage/income. The HPSRPC collaborated with local photographer, Terry Manzo, to offer photography workshops and mentorship to community participants. The participants were then tasked with photographing how living on low income effects their daily lives. 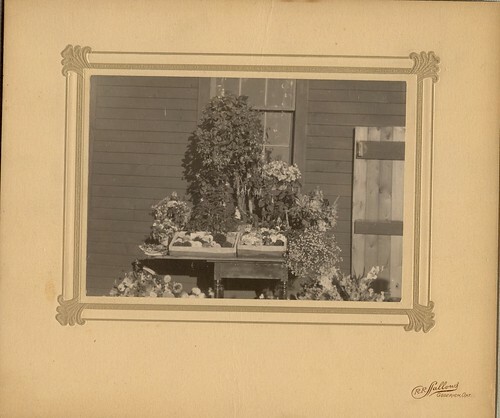 The Photovoice Exhibit will become a travelling exhibit in spring 2019. For more information, contact Reid at sreid@perthhuron.unitedway.ca or 519 271-7730 Ext. 228. 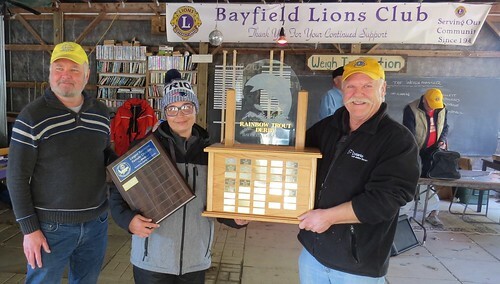 There was an exciting turn of events at the 40th Annual Bayfield Lions’ Club’s Joe Brandon Memorial Fishing Derby held on Oct. 12-14. Natalie Hardy, of London, ON bought her first fishing rod a few days before the Derby for $30 at Angling Sport in the city. 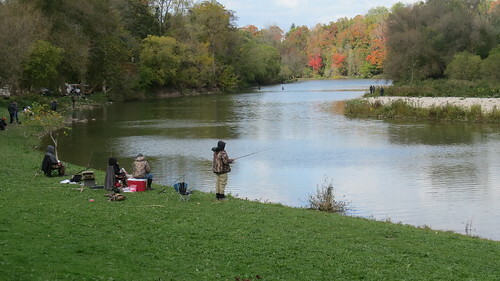 To the chagrin of all the seasoned, experienced fishermen in the Derby, Hardy, in her first outing ever, landed the largest Rainbow Trout at 9.36 lbs. 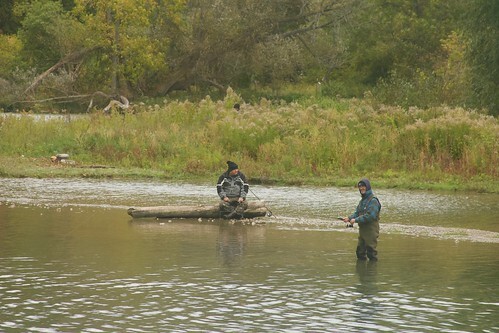 “Excuse the pun but I may now be ‘hooked’ on this sport,” Hardy said. 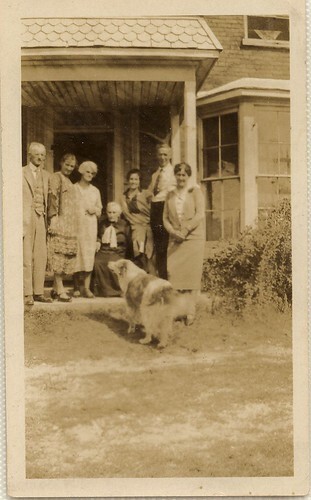 Not only did Hardy win the Derby grand prize of $800 but she also won the prize for largest fish caught by a woman. 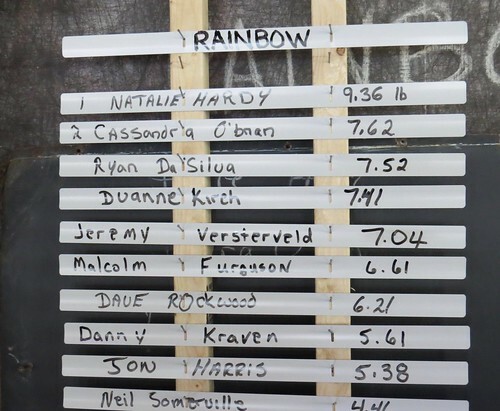 Second prize in the Derby also went to a woman, Cassandra O’Brien, of Kitchener, for her 7.62 lb trout. 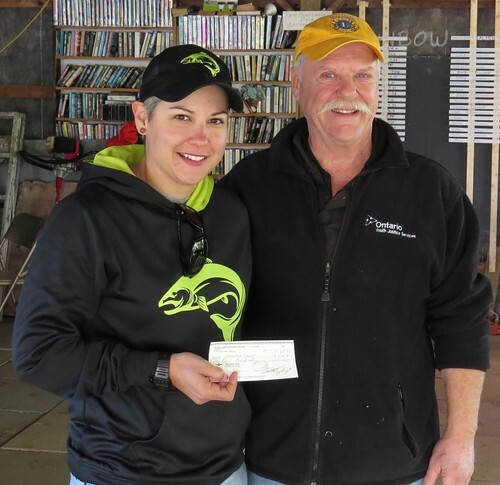 In a show of good sportsmanship, Hardy graciously gave her prize for the biggest fish caught by a female, that consisted of a trophy and $100 gift card donated by Angling Sports, of London, to O’Brien. Third place winner was Ryan DaSilva, of London, for his 7.52 lb. 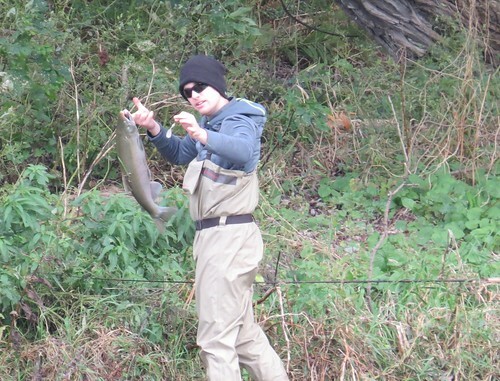 trout. 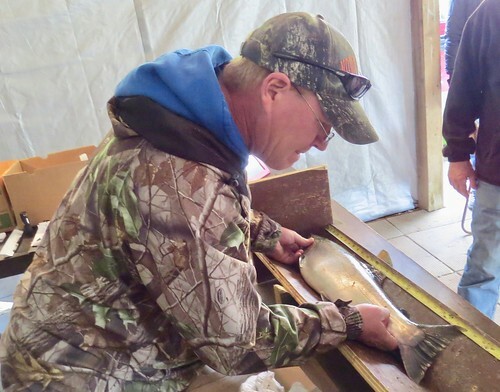 Larry Robidoux earned the prize for largest salmon caught at 11.98 lb. 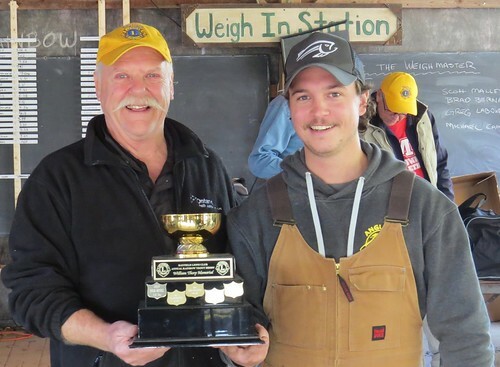 The Bill Thorpe prize for the largest trout caught by a 16-18 year-old contestant went to Connor Mitchell, of London, for his 3.30 lb. fish. 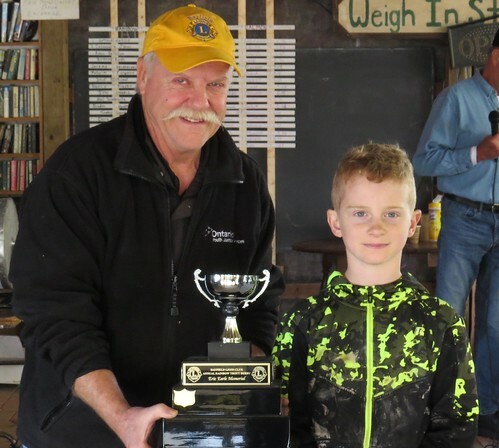 The Eric Earle prize for the 15 and under age group went to Braden Vorsteveld for his fish that weighed in at 4.36 lbs. Long-time weigh master, Tim Moon again did the measuring and weighing fish as they came in and logging the stats on the board. This was Moon’s last year of a seven-year stint as weigh master. The crowd honored him with a loud round of applause and cheers. Lion Tom Grasby, Derby director, expressed his thanks to the participating fishermen. “Once again we sold out all 250 tickets and we had a record number of young people entering,” Grasby said. 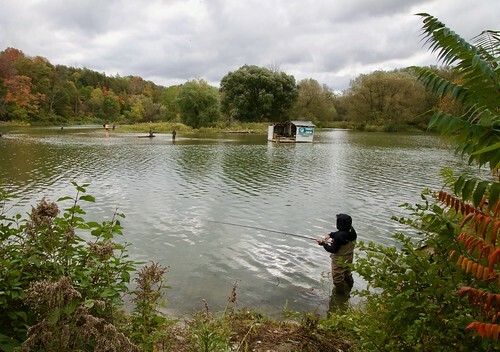 Grasby thanked all of the local sponsors of the Derby and in particular noted the contribution by Pat Devincenzo, owner of Angling Sport in London, for his sponsorship and making available hundreds of dollars in prizes from his London store. He also gave a special thanks to Gary Brandon, owner of Rainbow Valley campground, for his years of personal support and providing the wonderful venue for the Derby. 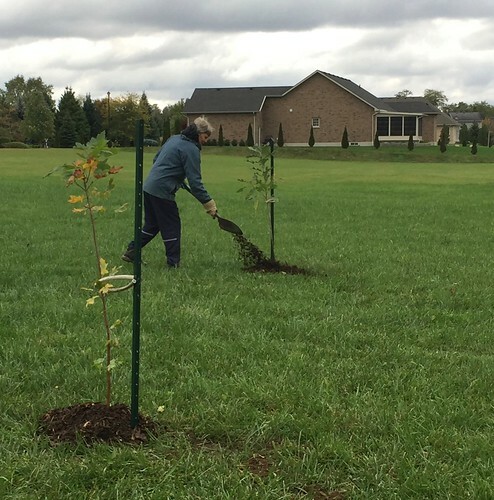 “Without Gary’s commitment every year this event would not happen,” said Grasby. 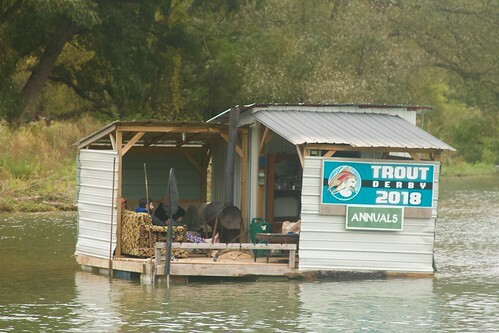 Fishermen made a special effort to keep their fishing sites clean both in the campground and in adjacent river properties. “It is important to work with neighboring riverfront owners to make this derby a success,” Grasby added. Raise your hand if you attended the Bayfield All Candidates Meeting on Oct. 11 at the Bayfield Town Hall. Now raise your hand if you took advantage of the live streaming on Facebook of the meeting and watched it from the comfort of your own livingroom couch. I was one of the latter, and yes, I watched all two hours, 11 minutes and 41 seconds of it. P.S. 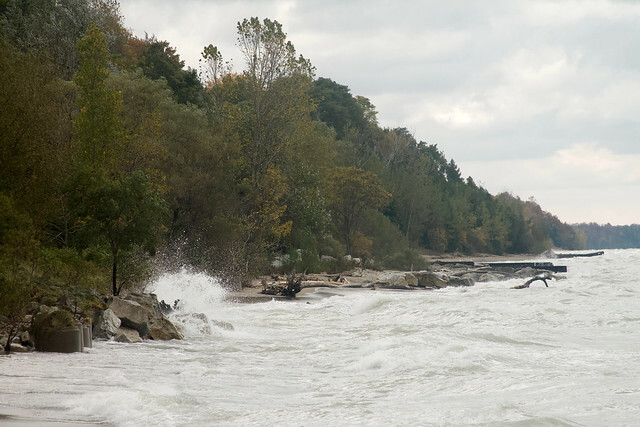 If you have yet to cast your vote and would like to review the meeting before you do so visit the Facebook Page - "Bayfield Ontario" and scroll down to the video posted on Oct. 11. Online and telephone voting is open now until Oct. 22 – 9 a.m. to 9 p.m.
For more information, follow the link provided here: http://municipalityofbluewater.ca/Public/Municipal-Election.